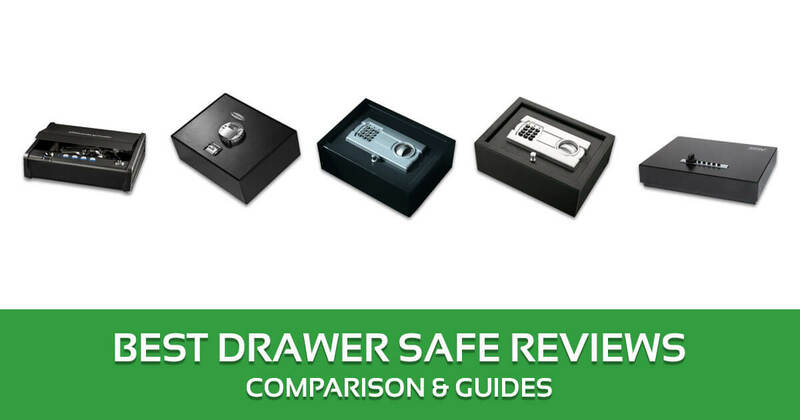 Are you in search of the best drawer safe reviews? Well you’re in the right website as I am here to provide assistance. I have a lot of experience using drawer safes, and I have compiled here the top 5 drawer safe you can buy online. If you’re looking for a drawer gun safe, it’s best if you know just what they’re for. Their main purpose is as a safety storage for your handgun, but you can also use these to safeguard money, coins or other small items. I put emphasis on small items, because these safes are small enough to be placed inside a drawer. While their small size limits the amount you can put inside it, these safes are easier to conceal. 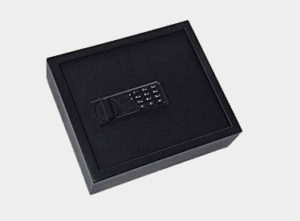 These are not just simple boxes however, as they have features to safeguard the contents. In the following section I’ll show how to buy the right drawer safe. A pistol drawer safe has the same function as all the rest, but their features vary and this has a direct effect on their functionality. If you want to get the most out of your purchase, consider the following. Are you going to use the safe solely for your gun or other items? Knowing the answer to this question is going to determine the right size for you. Most of these safes have a “universal” fit, meaning they can hold most pistols. But if you have a large handgun, make sure the dimensions are correct. Read the product dimensions carefully, and take note of the difference between the exterior and interior dimensions. How secure is your gun going to be in that safe? If your kid manages to open the drawer, will they be able to pry open the lock? These safes use different systems such as combination, locks, biometrics or a mix of the three. An override key or function is handy in case you forget the combination. Just because these safes are small does not mean they are fragile. On the contrary the good ones are built for long term use. Look for safes made from solid steel, or mostly solid steel for extra security. The most durable pistol safes have the hinges hidden and thick walls. Does the safe need batteries, and can you plug it into a power source? Consider the power source as it’s going to be crucial in case of an emergency. If the safe runs on batteries, make certain it emits a loud sound indicating the battery needs replacement. Some battery powered safes don’t include the battery. Keep in mind also the capacity depends on the size of your pistol, and if small enough you can fit two in the safe. 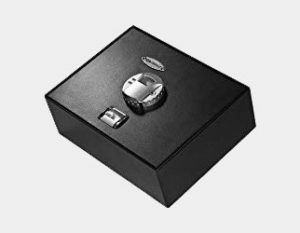 Safes hold and store sensitive items from theft or access by unauthorized personnel. To keep your valuables secure, check out the following best drawer gun safes available on the market. 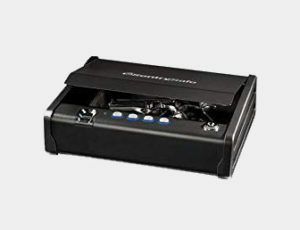 The Stack-On biometric drawer safe is designed as an all-around repository for your pistol. Unlike other gun safes the Stack-On doesn’t sacrifice quality for portability. Measuring 11.8 x 8.6 x 4.2 inches, the safe is compact enough for use on the road, office or the home. Its construction boasts of hidden hinges, metal live action locking bolts and pry resistant plate doors. The 3 failed entry lock out is another great security feature, and the pre-drilled holes add to the convenience. By mounting the safe, burglars will have a hard time removing it without raising a ruckus in the house. The safe conforms to the standards set by the California Department of Justice, and it is a heavy case. You can also anchor the unit as the necessary hardware is bundled. The Stack-On keypad works with 4 to 8 number combinations, and you just enter the code, rotate the knob and lift the lid. A keyhole is provided so you have another option for opening the safe. While you have dual access options, the keypad 4 to 8 combination makes the code difficult to crack, and the key is added security. If you make three mistakes while opening, the safe locks you out. There are two pins built into the safe so it’s hard to pry off. The solid design also means the contents inside receive protection from bumps and hits. The Stack-On is often used to store pistols, but you can also use this to house passports, coins, jewelry and other items. You can also place one large pistol here along with a magazine. The Stack-On is one of the best in drawer gun safe for the money, with more than enough room for your valuables. The V-Line small drawer safe is durable and designed as a portable security container. The lock allows for more than 1000 combinations, so it is virtually impossible to guess the right one. The first thing that you’ll notice is its construction, made from solid steel and a high grade lock. The box is built in the US and the lock is sturdily built and isn’t easily broken into. Some reviewers have commented on the quality of the lock, but it’s actually well-built and more durable than some may think. The lock only looks brittle, but if handled properly will hold up to regular use. If you’re shopping for the V-Line, you may notice a very similar looking product, the V-Line Top Drawer Tactical. However, the only differences between the two are the logo and finish. The safe doesn’t rely on batteries, so there’s no need to buy replacements or keep an eye on low battery indicators. Measuring 12.5 x 9.5 x 2.5 inches, the safe is small enough to put in a drawer for quick access. If you’re looking for a conceal carry option, the V-Line is a good candidate as it fits snugly in a backpack. The case is well-designed so it’s able to withstand more than a few hits while you’re on the road. Anchoring the V-Line is one of the best ways to keep it in place, and it’s made easier because of built-in anchor holes. The mounting plate is an optional feature that’s easy to remove. This is one of the best gun safe for drawer in terms of capacity and security, and it’s stylish too. The Barska is a top of the line biometric security safe for your gun and valuables. The box’s interior dimensions of 14.5 by 11 by 2.5 inches means there’s lots of room for whatever you want to put in it. Emergency backup keys are provided in case you forget the combination, and a protective floor mat is included. With the floor mat, any item you place inside gets some degree of protection. You should always clean the fingerprint scanner after use. A clean piece of cloth is enough, and you should also test the fingerprints every six months. The safe has a low battery indicator that turns red when the battery is low, but a four AA battery set is good for 2 years. As long as you’ve got reserve batteries on standby you’ll be able to use the Barska continuously. The biometric locking system on the Barska is similar to what you’d find in the best drawer gun safe. You can record up to 30 fingerprints and with the press of a recorded finger, the safe opens. Most handguns fit in the safe comfortably, but you can also use it for passports, credit cards, memory cards, and other stuff. The interior padding provides additional protection for the items. The safe is constructed from solid steel, with heavy duty bolts and hinges that will deter attempts at prying. There is a motorized deadbolt lock and steel locking bolts, and anchor points are provided. The Barska is rightfully considered by a lot of people as one of the best night stand drawer gun safe today, as its biometric control is top notch. The Paragon Lock is one of the best biometric drawer safe for the money, and what it lacks in fancy features it makes up for in quality. With the option to use code or key you can access the safe the way you want. The safe weighs 13 lbs. and measures 11.75 x 8.7 x 4.5. The locking mechanism is reliable and doesn’t get affected even if the code is changed repeatedly. The safe is designed for single handgun storage, and most pistols should fit. You can insert a full handgun like the 1911, but it’s more practical to use a smaller pistol. Aside from a compact pistol you can put a magazine in it. And with a depth of two and half inches it is sufficient for other small items. The Paragon comes with anchoring holes and fixing bolts, allowing for permanent fixing to the location. The necessary hardware is provided so setting up is quick and easy whether it’s in your home or vehicle. The safe is made of solid steel and designed to withstand mechanical tools and manual prying attempts. Both the interior and exterior have been powder coated and the hinges are tamper proof. The electronic lock is programmable up to 3 to 6 numbers. You can change the code as often you like, and in case you forget there are two backup keys you can use. The Paragon is a cost effective solution, and if you’re fine with a no-frills safe for your gun this is up to the task. I consider the Sentry Safe one of the best gun safe for drawer online as it offers lock and biometric security. It’s easy to program a fingerprint and along with the combination, ensures quick access. Once your fingerprint is recorded, wipe the scanner to remove any trace. To open the safe you press your finger and the lid opens. 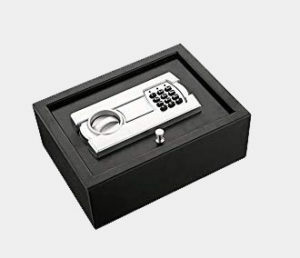 The Sentry Safe has silent hardware so it doesn’t make a noise when you use it. In addition the lid opens quickly so in case of an emergency you’ll be able to retrieve your gun. The safe has sufficient storage space for most small firearms, including the larger automatic handguns. Once locked, the pry resistant hinges and lid will keep burglars and the curious away. The instructions on the Sentry Safe are easy to follow so you can use the security features quickly. 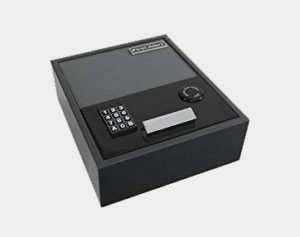 The Sentry Safe makes it easy to use the combination lock and the biometric controls. The scanner senses up to two fingerprints, allowing for single handed access. The digital keypad is also programmable, and since it doesn’t make a noise no one will know of the changes you made. The compression strut ensures the lid opens quickly and stays in that position. This means you can take out your gun while calling for help with the other hand, essential for emergencies. The Sentry Safe is built with reliability and security in mind. Not only is the safe made of solid steel but the hardware allows you to open the safe undetected. The Sentry Safe QAP1BE is a solidly constructed safe that provides quick access to your firearm when you need it. Whether you have pistols, ammo or other valuables in the house, you need to keep them safe. What better way to offer great security than with the Stack-On PDS-1500 Drawer Safe? The best feature of this drawer safe is its size. It has a perfect size making it the best nightstand drawer gun safe. To provide the best protection, this drawer safe has the most top-notch bolts and hinges. It comes complete with 2 live action steel locking bolts. The concealed hinges give your valuable the best security. 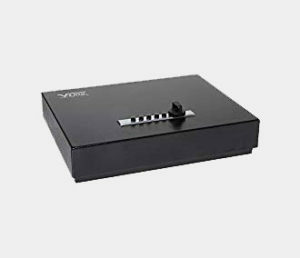 For an easy time locking and unlocking, the drawer safe has an easily programmed electronic lock. With it, you get a time-out period after 3 incorrect combination attempts. The most convenient feature of the drawer safe is the pre-drilled holes. All you need to do after buying it is mount it on a shelf/floor or wall. It also comes with fastening hardware. While other drawer safes can be opened with a paperclip, this drawer safe has been upgraded. Intruders won’t access it using a paper clip. Plus the reset button is covered. You’re the only one who’ll know where it will be. For the price of this drawer safe, it can’t get any better than this. So if you want something to keep away your valuables from your kids, for example, this is the drawer safe to go for. This can be your starter drawer safe. If you’re looking for a drawer safe with a little bit more storage, you’re in the right place. This First Alert 2074F Top-Opening Anti-theft Drawer Safe is the one to go for. If you have expensive jewelry, you need this safe. It has a protective floor mat to ensure that they don’t get scratched. The interior light will also make them glitter beautifully. This, therefore, makes the drawer safe the best drawer safe for jewelry. It’s not only limited to jewelry protection, you can store your gun, cash or important documents. This is because of its 0.35 cubic foot capacity. Its solid steel construction will ensure that your valuables are 100% safe. It, therefore, can’t be cut through, broken or dented. It’s also heavy. Carrying it will be literally impossible. 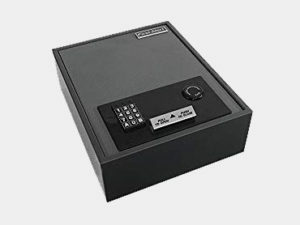 For added protection, this safe comes with a reprogrammable digital access. You can change the combination anytime you want. With the emergency override key, you can easily access your valuables when you forget the combination. For even more security, the drawer safe comes with 2live door bolts and pry-resistant concealed hinges. This means that they can’t be cut or tampered with. It also comes complete with mounting hardware and 4AA batteries. If fire isn’t your problem, this is the drawer safe for you. If it is, you may want to consider getting one that’s fireproof. Also, the price is perfect for this drawer safe. If you liked the First Alert 2074F Top-Opening Anti-theft Drawer Safe, this safe may be of interest to you. This First Alert 2079F Top-Opening Anti-Theft Drawer safe is perfect for storing your valuables from theft. Whether you’re storing firearms, cash or other valuable items, this safe will work for you. It comes with a protective floor mat to keep your valuables from scratching. Its interior light will also ensure you see the contents of your drawer safe. With its 0.67 cubic foot capacity, you can store an array of valuables inside. The ample safe will also ensure that your sensitive valuable don’t get mixed up with the dangerous ones. To keep intruders out, the drawer safe is made from welded steel and a solid steel construction. Steel can’t be cut through, broken or carried around aimlessly. For extra protection, the drawer safe comes with 2 live locking door bolts and pry-resistant concealed hinges. To allow you access to your valuables at any time, the safe comes with reprogrammable digital assess. You can change the combination anytime you feel like. Its emergency override key lets you access in the safe in cases when you forget the combination. If you prefer drawer safes with a bit more space, this is the one to go for. At that cheap price, you won’t get a better deal. However, if fire is your main concern this isn’t the safe for you. Looking for some piece of mind regarding your valuables? You need to consider drawer safes. 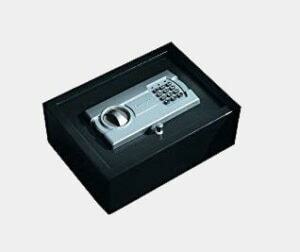 This BARSKA top open keypad safe is the one to go for. The compact size of this safe makes it very easy to hide from intruders or your kids. It can, therefore, be put in out-of-the-way places like your nightstand, the floor or the wall. You can never have enough space when you have valuables. That’s why you need this safe. It has abundant storage space for keeping multiple items like jewelry, firearms, ammo, money or documents. If you’re looking for a drawer safe with a combination lock, look no further. This drawer safe comes with a user-friendly digital keypad. It’s capable of retaining a one-pin code. You can use the code to access your valuables. In cases when you forget the combination lock, you can use its backup keys for access. For more protection, the drawer safe comes with 2 solid steel locking bolts. This ensures that the safe is never tampered with. With its 4mounting holes, it’s guaranteed that you won’t spend a lot of time and effort setting it up. As long as you have a flat surface, you’re good to go. Its protective floor mat ensures that your valuables are protected from scratching. It may seem to be unrealistic to get a drawer safe with all these amazing features. Don’t let the knob throw you off. If you use it gently it will last for a while. This safe is a versatile home safe. It safely stores and secures your valuables. This makes it the best drawer safe for a handgun because they’re the most dangerous. You can also store money, jewelry, electronics or important documents. If you want 100%security, this safe will offer it. Its exterior is made from steel material which is impossible to cut through, drill, break or dent. It has live locking bolts, solid walls, and a pry-proof door. This makes unwarranted access impossible. 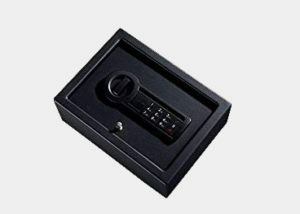 For easy access, the safe comes with an advanced digital keypad with LDC indicator light. You’ll easily see the code to avoid making mistakes. You can program the 0-9 digit code to get your unique personal access. In cases when there’s an emergency and you don’t remember the code, you can use the handy backup key. It has been uniquely designed to fit under the bed, inside a drawer or on the wall. If you want a safe that’s for storing very few items, this is the drawer safe to go for. You can easily carry it to move it to safer places when necessary. Buying the best handgun drawer safe is a good investment for many reasons, and the following are the most pertinent. Safety: there’s a reason why they are called safes, and it’s because they’ll keep your pistol safe from unauthorized users. Preserve Your Rights: a common but unfounded criticism against guns is they’re more of a peril than anything else. With a gun safe you can put that matter to a rest. Keep Children Safe: it’s easier to conceal these guns and keep them far from curious kids. Burglar Protection: the primary purpose of a gun is to protect yourself and family. With a safe, you’ll always have quick access to your weapon. Legal Protection: in the event that your gun is stolen, having a safe proves that you took all the measures necessary to secure it. Protection from the Elements: well-made drawer safe offers some fire and / or water resistance. Guns are sensitive and need protection, and that’s what gun safes provide. Concealed Carry: these gun safes are portable enough to carry, something you cannot do with larger safes. Durable: once you buy a portable gun safe, it’s going to last a lifetime. The best pistol drawer safe doesn’t require a lot of maintenance, but you’ll get more out of it by following these simple tips. Keep the Draw Safe Secure: these safes are hard or impossible to open without the right code / combination. But that doesn’t mean you should let anyone try without your knowledge, so place it somewhere safe. Know its Limitations: these aren’t as sturdy as full-blown safes, so don’t treat it like one. Know what its capable of and you’ll get more from it. Mount if Possible: mounting the safe makes it harder for anyone to try and pry it loose. You could hide the safe in a box or drawer, but it’s easier to mount. Follow the User Guide: read the instructions for its use the lock. A lot of potential issues can be avoided by simply following the guidelines. Practice Using the Safe: don’t wait for an emergency to learn how to use it. Learn how it works, how quickly it opens and so on. Keep the Safe Clean: open the safe every now and then, remove your gun and clean it. Clean the safe too and replace the contents. What is the right safe size? There is no single right size, as it depends on what you intend to put inside it. The size of the safe depends on your gun’s specs so use that as your guide. Most gun safes however, have room for one good sized pistol and some ammo. Can drawer safes really be considered a real safe? Yes. However, they’re not as durable as other safes so you have to use them properly. Please follow the user guidelines on how to use them. What is the difference between a regular safe and a biometric safe? A biometric safe uses your fingerprint to secure the safe. Instead of turning a dial, you simply press your finger to open the safe. A lot of combination handgun safes now have biometrics built in for additional security. Can all pistol safes be anchored to the floor or walls? Almost all of them can be anchored or mounted, and it’s a good idea if you do. If the safe is mountable there will be pre-drilled holes or a mounting kit included along with the instructions. 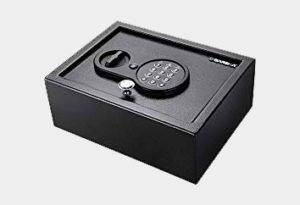 All of the drawer safe models I have reviewed are top quality, but the one that gets my vote is the Barska Biometric Safe. It was actually a close call between the Barska and the V-Line, but I give the edge to the Barska because of its biometrics and ease of use. I can’t emphasize enough how vital it is to get the right pistol safe, as it makes all the difference in terms of security, safety and accessibility. Hopefully by reading the best drawer safe reviews here you’ll know exactly which product to buy. The gun site is not only my ideal site to visit among others but also I like the way its detailed when it comes to gun issues and many other products. My car booth is a little bit small and I needed about 3.2 x 12.0 x 9.9 of a safe what exactly the Sentry Safe Biometric Quick Access Pistol Drawer Safe is all about, thank you for this post.